On my birthday week, my Mum and Dad surprised me by hiring a VW camper van for the week. It was amazing but what was really special was that the camper van was called 'Alice'. Mum and I drove SLOWLY back to Bude and I was so happy to be back down there. I thought that I'd already got my birthday present but when I turned up at Big Blue on my actual birthday morning, I couldn't believe that Mum and Dad had bought me a new surf board from Zuma Jay. Unbelievably, I managed to catch the very first wave I went for and I had a really great day. At night time, we went out for dinner at the site we were staying at which was called Wooda Farm - it's where we stayed earlier in summer too. When I wasn't surfing, me and mum spent the week driving around in 'Alice' which was so relaxing. Everywhere we drove, people beeped and waved at us. It's definitely something to add to your 'to do' list. When I got home, I had to get all my school stuff sorted as I went back at the end of August. I'm in my final year now, year 11 and it's all work and exams. I haven't decided exactly what I want to do next year, but I'm hoping to do something in TV / film - either behind the camera, art dept or screenwriting, so I might go to college and take the BTEC route to Uni, rather than standard A levels. Other than English and Art, I'm not really good at anything and so I think I'd be wasting time trying to do 4 A levels. I was also interested in doing something with the outdoors, but although I got an A* in the physical side, I got an E in the theory and ended up with a combined 'C' for my GCSE PE. Science definitely isn't a strong point of mine. Sorry Mrs Hesford! So, I'm back at school and have loads of work that I need to get sorted. I'm enjoying Geography which is one of my new one year courses and off on a field trip next week, to gather data from a river. I've also agreed to play netball for school, which is really as a fill in, but without a few extra people volunteering, we won't have a team and so I'll just do the best I can! I'm back to working out a few times a week as I've let that slide over summer - I have a few events to attend in the next few months, so I don't want bumpy bits in my dresses! Plus it will give me a head start for the next K2B in May. After the awards, our charity is holding a 'Christmas in November Ball' on 28th November. All the details are going to be on the website soon but it's going to be Black Tie and I think there'll be a lot of purple dresses :) Alice would love to know that we are keeping her Christmas in November going - for anyone who doesn't get it, you'll have to look back through Alice's posts, but we'll be putting her Festive Lights purple tree up again. It's also followed by the Dickensian Festival in Ulverston, so it will get everyone in the mood for Christmas. A couple of weeks ago, I joined the Anthony Nolan register which was a big thing for me. I promised Alice I would do it as soon as I could and I just hope that one day, I'm a match for someone. There can't be anything better than saving a life. Mum is starting up a voluntary group to visit and educate college students in the area and so I went along to one of the training events and it was really nice to see so many others turn up to join our team. Having a team of people will mean that we can cover all 16-18 year olds in the local area. If you want to know more about the Anthony Nolan register (16-30) click HERE ... if you are older but would like to help, details on Delete Blood Cancer (18-55) is HERE. My very own spit kit! 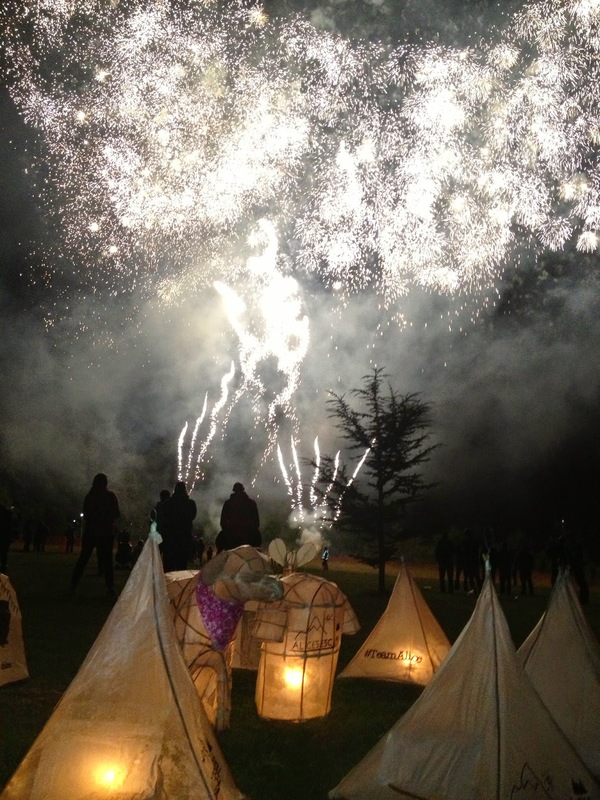 Just over a week ago, Team Alice made lanterns and joined in the Ulverston Lantern Festival again. We didn't do it last year because it just felt wrong without Alice but this year, we thought she'd want us to and we had a great evening. I made Team Alice t-shirt lantern, and Mum carried the Mabel lantern that Alice made three years ago and it got lots of attention. The weather was brilliant and the fireworks at the end were like been at Disney, they were amazing! I've just been down to London to see my new team to plan the next stage of my treatment. I'm slowly having to move on from Great Ormond Street which is really sad and I was at the Eastman Hospital in London to look at moving my teeth and my jaw forward. I was a bit unsure about the hospital initially, but the team were really nice and I still have some of my old team too, so that made it better. I think it's just because I've gone to GOSH for 16 years and everything feels familiar there. This week in school we had a lady who'd had cancer come in and talk to us about a charity she is involved with and she talked a lot about cancer and kept saying how rare it is for a child to get it. I get uncomfortable when people talk about cancer in a simplistic way, because as well as me losing Alice, there's other people in our school who have lost people very close to them. It's nothing to do with been a fighter - there wouldn't be any cancer left in the world if fight had anything to do with it. It's luck of the cancer, luck of where you live and luck of the treatment you do (or don't) receive. After accidents, cancer is the leading cause of death in children. It kills more children than the things that most Mums and Dads worry about most. Well, I started this on the 12th and it's the 28th now, but at least it's here - I have loads of work to catch up on and I've to get my outdoor gear ready for a geography field trip tomorrow, so I better go! As usual you are very busy. I don't know how you do it all! Congratulations on your award nomination and joining the Anthony Nolan registry. OH and Happy Birthday!!!! Hope you have a wonderful final year of school. 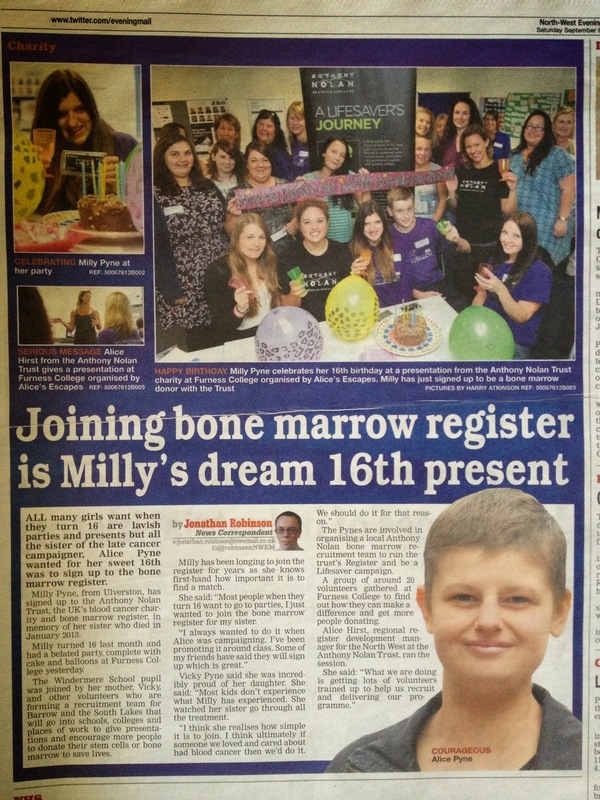 Congratulations on joining the bone marrow register. I hope your next lot of treatment goes smoothly and you are happy with the results. Good luck with the award, hope you get lots of votes. Milly! Don`t you ever say or even think you are no good at anything! You have achieved more than a lot of people achieve in a lifetime! You have a lot of knowledge and understanding and you use it wisely. Knowledge is not judged by a mark on a piece of paper! Very very nice to hear all your latest news, Milly, it fills me with a warm glow, honestly. It is a real pleasure to see you growing up (sorry to sound patronising!) but also growing into such a lovely, warm, young adult. I am glad to hear you had such a nice birthday. Your college idea sounds fab, especially if you are more practical. 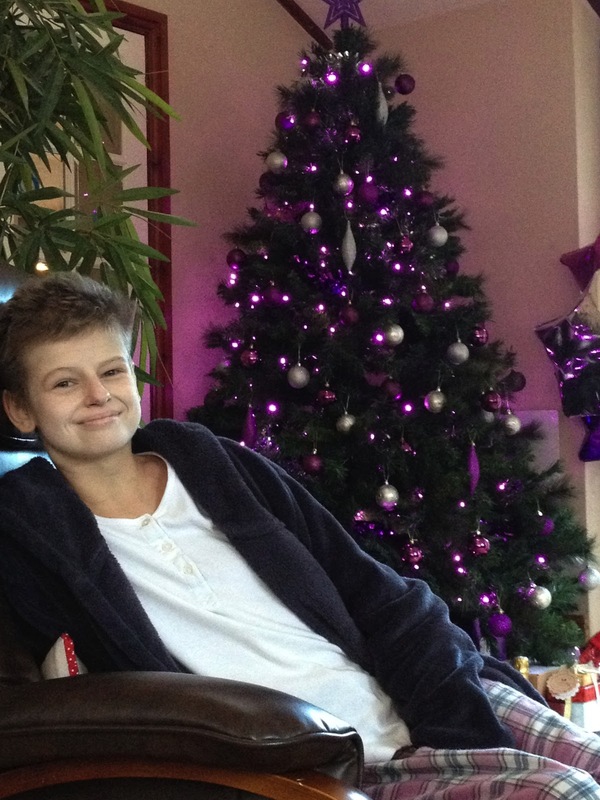 It's very interesting to hear all about how you and your family continue to do positive things in memory of Alice and it reminds us all when we read about it here, to keep Alice in mind and to live our lives! She and your family have already helped many people and will help many more, just through bringing awareness and attention to ways that we can work to help each other. It was nice to see Alice's picture again and I am sure she would be very proud of you all. I ran across your blog when I was making my own bucket list. You are such a wonderful lady and I am sure your sister is so proud of you. I understand what you are going threw. I lost my sister to breast cancer this past February. Its very rough. but coming across your blog has inspired me so much. Keep your chin up sweet girl. Wow, you have really good thoughts, not everyone think like that. Congratulations on getting sixteen and believe me you are really a good human being.